Traditional recipes call for very long roasting times, but for a moister turkey, don't over cook it! Allow 15 min. resting time before carving; meanwhile strain the pan juices and use for sauce or gravy (read on). While the turkey is resting before carving, strain pan juices, add HERBS, and bring to a gentle boil. Dissolve cornstarch in cold liquid, add to the juices, and simmer 5 minutes, stirring, to thicken and set flavors. Add mustard and honey, salt and pepper. Pour the sauce into a deep preheated serving dish and keep very hot, but not boiling. At the last minute, the sliced turkey can be placed directly in this dish and sent to the table. The beauty of this technique is that you do not have to overcook the turkey, which is so often the ruin of the bird! Even slices which are slightly pink will cook through on the way to the table! Result; say goodbye forever to dried out, lukewarm turkey; it will be moist, juicy and fragrant. Turkey is so easy and economical, why wait for the Holidays? Unstuffed, it's as simple as roasting a chicken, and even a small one gives a blessing of leftovers. As director of Fetzer Vineyards' culinary center, noted Chef and author John Ash created many recipes to showcase Mendocino County's gourmet products. Saute onions and garlic in 2 Tbsp. butter till soft and golden; set aside. Saute' soaked and drained mushrooms in 2 Tbps. butter until lightly browned. Combine all the ingredients, season the turkey inside and out with liberal salt and pepper, stuff the bird and skewer shut. Set on a rack in a roasting pan, breast side down. Roast in preheated oven at 325 for one hour, turn breast side up, baste with pan juices (as in the above recipe) and continue cooking for 14-16 minutes per pound or until temperature at the thigh is 160. Allow the bird to rest, tented with foil, for 20 minutes before carving. Stuffings can be baked in separate dishes for 1-1/2 hours if you prefer. 1 cup almonds, oven-toasted till crunchy, 10-15 min. Toast the almonds on a cookie sheet at 350° for 10-15 minutes. In a heavy saucepan, saute onion until trans­lucent in butter, oil or margarine. Add rice and sauté rice and onion together briefly, a minute at most, add water or stock (stock is best), and salt. Simmer, covered, no more than 15 minutes for white rice, 30 for brown, or u.ntil rice is still quite firm. Meanwhile, drain sauerkraut and rinse it well or not, depending on how tangy you like your food. (I wouldn't rinse at all, but my husband wants it really washed, so we compromise.) Drain well. Mince garlic in the food processor, then almonds, until large chunks are gone, but not too fine. Now chop the apple. In a large bowl, combine everything, then test for seasoning by frying a bite and tasting it. Stuff the turkey fore and aft, and roast according to directions for Terrific Turkey. Keep the stuffing warm while you carve, and serve with the hot pan juices. Instead of drawing moisture from the bird as a bread stuffing would, this mixture will add liquid and will give a wonderful tang to the drippings. It's always fun to serve this surprising treat to guests who would never imagine such a combination. Enjoy! This is an adaptation of a Swiss dish with the unlikely name of CHOLERA, which uses leeks instead of onions. Leeks are grand if you have them. Serves four. Parboil two whole medium potatoes, skins on, for 15 minutes, drain and cool. Core and finely slice two ripe apples and a large onion, parboil together 5 minutes, drain and cool. Meanwhile make a pie crust from your favorite recipe, or puff paste, or filo dough. If using filo, defrost by package directions, then lightly butter and stack at least 10 sheets. Install the crust in a deep pie or quiche mold (tuck overhanging filo edges back in along the sides), and pre-bake 10 minutes. (Lining the crust with foil keeps it erect during prebaking.) Slice the cooled potatoes, skins on or off, and layer half into the tarte. Layer on half the apples and onions, remaining potatoes, then apples and onions neatly on top. Dot with chunks of sweet butter. Beat together two large eggs, four ounces cream cheese, one-half cup cream, 1 Tbsp. 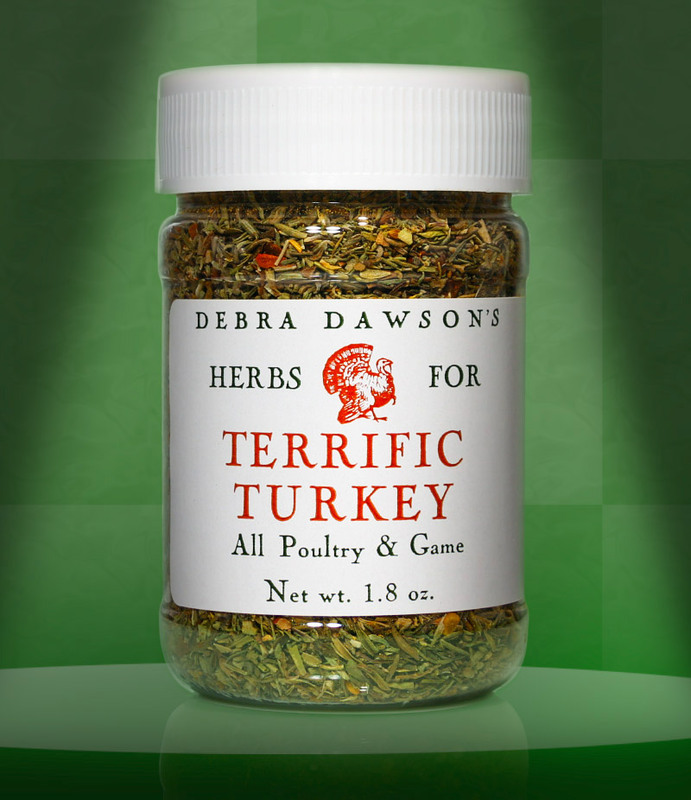 TERRIFIC TURKEY HERBS, 1 tsp. salt, and freshly ground pepper. Pour over the tarte and bake 1 hour at 350. A lower-fat alternative is to use ricotta in place of cream cheese and milk for cream, or do as the Swiss do, using Gruyere cheese. It's lovely.